While driving through Rapid City, I was afraid all of South Dakota was going to be just as congested. However, as my husband and I crossed the town line into Keystone, we were pleasantly surprised when the sign read “Population 337.” This remote mountain town is nestled into the ponderosa pine trees of the Black Hills and only minutes from Mount Rushmore, Crazy Horse, and Custer Park. We stayed at the K Bar S Lodge on Old City Road, despite its unusual name. The lodge was rustic, yet contemporary. Its atmosphere and employees were very welcoming as the smell of complimentary beverages whiffed through the lobby and into the back patio. The air outside filled our lungs with clean oxygen from the hills. Coming from the New York metro area, this transported us into another world. It was evening, so Mount Rushmore was already closed. We decided to make the five-minute drive anyway and were greatly compensated for the effort. The faces of Washington, Roosevelt, Jefferson, and Lincoln were lit up against the black sky like spirits watching over the country they helped build. It took the son of immigrants, Gutzon Borglum, and over 400 workers to create this granite masterpiece. Every American should be required by law to behold this man-made wonder. The next morning, we ate a generous breakfast buffet on the hotel deck, with a view of this magnificent sculpture. At $125 per night, that alone was worth the price of the room. After digesting, we spent hours at Mount Rushmore National Memorial walking the Presidential Trail and absorbing all its history in the Museum and Visitor Center. We sat contemplating on the Grand View Terrace, wondering what these American icons would think of their tribute. The following day we drove 30 minutes to the massive statue-in-progress called Crazy Horse to experience a very different history. Sculptor Korczak Ziolkowski began this colossal undertaking in 1948. When he died in 1982, his wife Ruth and their 10 children took over. Since it is privately funded, the process is ongoing with no scheduled end date. What drives a man of Polish descent to dedicate his life and family to ensuring that Americans know what part the Lakota Indians played in their history? Having experience in the mining business, we hold a great appreciation for the arduous work and challenges involved in drilling and blasting these monoliths. 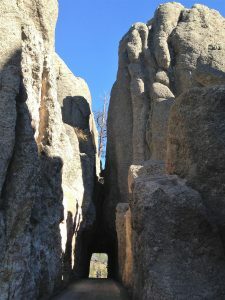 That afternoon we drove a short distance to Custer State Park, starting out on Needles Highway and meandering through the rocky spires of this mountainous landscape. Continuing south on Wildlife Loop, there were many bison and pronghorns in sight, but the most amusing were the begging burros. They strolled up to the car, putting their heads in the window while sniffing for food. It appeared as if they owned the park and were toll keepers demanding payment for this breathtaking journey. We then continued north on Iron Mountain Road through various rock tunnels before heading back to the lodge. If you want to fully experience the Black Hills, fly into Rapid City and stay in Keystone. Allow at least two full days to see the sites, and as always, when visiting the U.S. National Parks and Memorials, be prepared for anything!